West Chester, OH; September 2018—At PRINT18 in Chicago, Ricoh and Color-Logic will collaborate to demonstrate how the latest Ricoh features--white toner and dynamic new neon colors on Ricoh 7200 presses--provide printers with the ability to show how digital printing outshines conventional processes. Discussing the collaboration, Color-Logic Director of Sales and Marketing Mark Geeves said: "The latest Ricoh digital presses, to be shown at PRINT 18 in Chicago, provide graphic designers with the platform that brands and product marketers can use--together with the Color-Logic Process Metallic System--to differentiate their products on the shelf." Geeves continued: "With Color-Logic software, graphic designers can effortlessly create files that, when printed on the Ricoh 7200 digital presses, produce incredible decorative effects. Using the white toner available on the Ricoh 7200, designers can quickly and reliably produce files to print on metallic or pearl substrates. Also on 7200 presses, available Ricoh neon toners yield as many as 1520 neon hues when print files are created using the Touch7 software offered by Color-Logic." At PRINT 18, Color-Logic will exhibit in booth 4133. Ricoh will exhibit in booth 3011. Amazing Color-Logic and Touch7 samples will be available in both booths. West Chester, OH; August 2018—Color-Logic has certified MDV Ultra Silver substrate for use with the Color-Logic process on Ricoh Pro C7100 and Pro C7200 Series Digital Presses. Confirming the certification, Color-Logic CTO and Co-Founder Richard Ainge commented: "The MDV Ultra Silver substrate provided excellent test results off the Ricoh Pro C7100 and Pro 7200 Series Digital Presses. The MDV technology provides single or dual-sided substrate, opening up new markets and applications for brands, agencies, and design firms using printers with Ricoh Pro C7200 or Pro C7100 presses and white ink. MDV Ultra Silver substrate is available in a variety of paper weights." West Chester, OH; August 2018—Color-Logic has certified KernowPrint Metalik substrate for use with the Color-Logic process on Ricoh Pro C7200 presses. Discussing the certification, Color-Logic CTO and Co-Founder Richard Ainge, said: "Tests of the Kernow Print Metalik substrate with the Color-Logic process on Ricoh Pro C7200 sheetfed presses produced the complete range of Color-Logic metallic colors and provided excellent examples of Color-Logic decorative effects. A major benefit to printers is the Kernow coating technology, which reduces static when feeding the sheets into the press." Ainge continued: "The combination of Ricoh white ink, Color-Logic decorative effects, and Kernow substrates enables brands around the world to benefit from the large installed base of Ricoh presses that use white ink." West Chester, Ohio, USA; April 2016—Color Management Group (CMG) announces the intent to distribute a special bundle of Color-Logic for Packaging and Prototyping applications. CMG will debut their new solution for the Packaging market on March 7th and 8th at the Flexographic Technical Association’s annual INFO*FLEX show, at the Fort Worth Convention Center in Booth # 131 from 1:30-6:00 pm. Atlantic, Tomorrow’s Office, was founded in 1959 as Atlantic Photocopy. Since its inception, Atlantic has grown from a 5-person operation to 300-plus employees supporting more than 20,000 customers. Atlantic is an office technology and IT solutions company—a Value Added Reseller (VAR) in the truest sense—providing horizontal niche market services to small and large corporations in the New York City metropolitan area. Atlantic offerings include: Imaging, IT Support, Document Management and Managed Services. For more information, visit www.color-logic.com or call +1-513-258-0047. West Chester, Ohio, USA; March, 2016—KKP Barrie has been named by Color-Logic as the first Ricoh Pro™ C7100 Series Digital Press, certified by Color-Logic in Canada. Announcing the certification, Color-Logic's Director of Sales and Marketing, Mark Geeves commented: “Production prints from KKP Barrie demonstrate the capabilities of the Ricoh Pro C7100 Series Press with white toner – When combined with Color-Logic, the Ricoh device enables KKP to access new market applications and offer new services to their clients". "The world today is about differentiation and KKP Barrie’s design and production capabilities will make it a positive experience for their clients to see what is possible in print” says Geeves. Color-Logic™ develops color communication systems and software tool sets for a variety of special effect printing applications. Color-Logic provides brand owners, product managers, corporations, and their advertising agencies the ability to differentiate themselves and their clients with a simple print production process that yields dramatic results. Color-Logic decorative effects utilize the existing workflows of printers and designers, yielding dynamic results without the use of special equipment. Color-Logic supports the value of print and works with designers and printers to enhance their printed media. 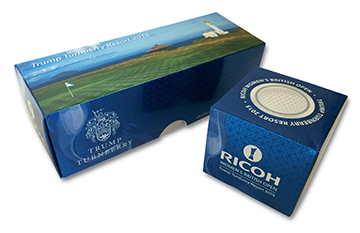 West Chester, Ohio, USA; February 2016—Color-Logic and Ricoh helped make the 2015 Ricoh Women’s British Open a sparkling success by furnishing VIPs with keycard holders and golf ball boxes. 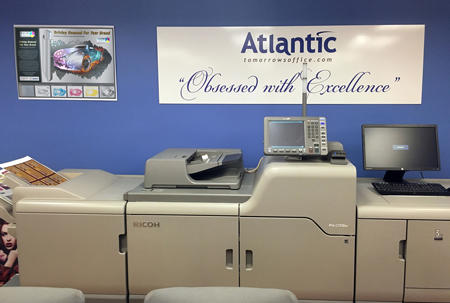 The materials were printed on the new Ricoh C7100 press with white toner, using files prepared by the Color-Logic Brand Services Group.